This morning was great. As much as we still had to get up ridiculously early, we did not have to dress for school. Why? Because we were going on a school trip! Today we were going with G.10-12 to plant rice in the principle’s fields. 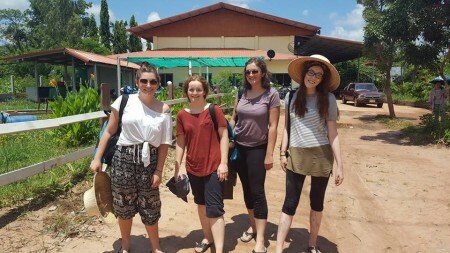 These trips happen often at the school in the upper years. I assume it’s to teach the students about traditional Thai culture. Another reason this morning was great: we had sandwiches and more pancakes for breakfast! 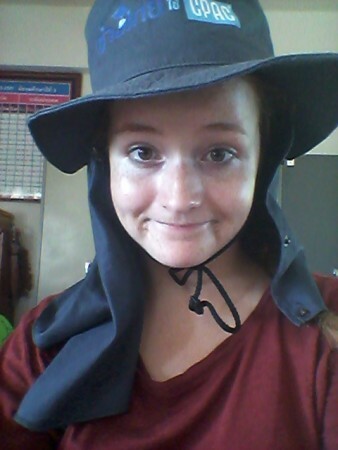 While waiting in the staff room, Aum came in with hats for us to take to the rice fields. I’ll let you judge for yourself. 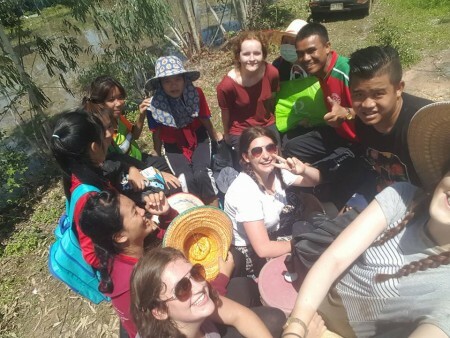 We were then told that we were leaving and watched the students get on various school buses and go to the rice fields. But we were still waiting for our truck. Whilst we waited we found that the school has its own little convenience shop. So we needn’t trek to seveneleven anymore. Our truck was still to arrive after everyone else had gone. One of the teachers came up and explained that her truck had become stuck in quicksand! She managed to get it out soon though. We then realised that there weren’t enough seats in the cabin for the four of us, Aum and the Chinese teachers, Yang and Dong. 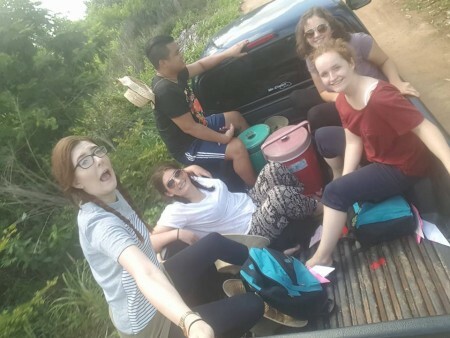 So the five of us, Aum, Eilidh, Hannah, Kate and I got in the back of the truck and sat on the edge down the motorway. It was the most terrifying thing I’ve done so far. 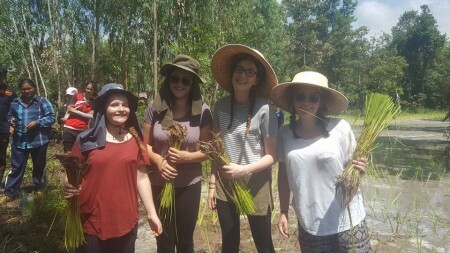 We were practically in the jungle when we arrived at the rice fields. But after a long detour I was ready to plant some rice. It was really muddy and really disgusting. 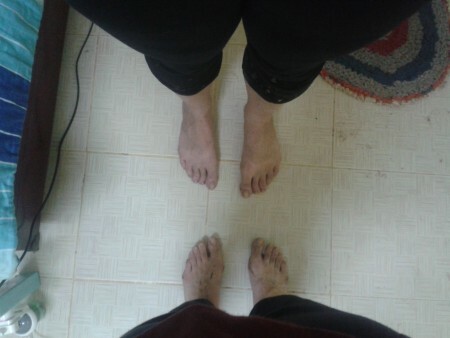 We had to go into the mud bare foot – it came up to the middle of my calves. Then we had to stick our fingers in the mud and make a hole to put the rice in. I thought I was doing okay, and then one of my G.12 students told me that I needed to put two rice seeds in at a time instead of one. Let’s just hope some hope someone went over the rice I had planted afterwards. On the journey back we were in a truck with lots of students, so it was a tight squeeze travelling back. But I’ll let you decide whether it was more or less safer than the journey there! Thankfully we didn’t have any lessons that afternoon, so we just relaxed and chilled until dinner. Although I probably should have packed for the weekend instead.